Massive FISCAR grid again graces Castle Combe to take prime slot! There seems to be some magical pull that Castle Combe has for its Autumn Classic and this last meeting of the season is becoming a ritual: It’s October; it’s Castle Combe; and there is a buzz. An extremely popular meeting with drivers and spectators alike – where do they all come from at Combe; it has a fantastic following – with a series of races for this festival that just ‘feels right’. This year the Combe organisers arranged some rugby games later in the day, amazing really, the teams seemed to have come from all over the place! Not sure if that will happen next year though… Most in the FISCAR race did at least one other race, be it Healeys, Jaguars, Saloons or invitation races. One thing is for sure, smiles are in abundance usually topped up with autumnal sunshine, and this event was no exception. The irony is that this is a meeting to look forward to, yet it marks the end of season, so a double edged sword indeed. The paddock was well organised this year and signing on early avoided the chaos of previous years. Our FISCAR grid was again by far the best of the season with nearly 40 cars entered, which made for a few busy corners. Add to that a number of shared drives so something like 50 drivers. Similar format to previous years, with the pit lane open after 5 mins of the half hour race, and closing at 25 mins for driver changes or an obligatory pit stop of 45s. Combe regulars follow Formula Fords and various one make series such as modern(ish) hatchbacks, this makes for competitive racing and tightly fought championships. Put FISCAR in front of these crowds with 17 different marques from the 1950’s and they are in for a real treat. It was a fitting finale to what had been a season of mixed fortune to say the least. The organisers had clearly taken note of the fact that our grid last year was the biggest of the meeting, as it was to be again this year, and we were allocated a prime slot in the middle of the meeting with Race 4 on this excellent programme. Where else would spectators expect to see Connaught; Cooper; Fraser Nash; Lister Bristol; Wingfield special; alongside the more regular Jags, Astons, Healeys, Lancia, MGA, TR2, and the like, a spectacle that kept the commentator team well occupied in reminiscing throughout the day. Two cars of particular note, since neither had run with us before, joined this great field. One was Adrian Beecroft's superb Aston Martin DBR1/300, one of only 5 ever built and the very car that had come 2nd at Le Mans in 1959, and 4th at the Tourist Trophy in the same year, driven on both occasions by Maurice Trintignant and Paul Frere. The other was the equally rare Arnott Lea Francis of Arthur Smith-Fitchett, one of 6 built by Daphne Arnott in 1954/55, but the only one to be fitted with a Lea Francis engine. This was its first race outing after a full refurbishment and repaint in its original primrose yellow livery. It was one of only two FISCAR FLIERS in the race, the other being Paul Griffin's superb Connaught ALSR, also Lea Francis powered. New drivers to our ranks were Katarina Kyvlova who was sharing Graham Robson's Austin Healey 100M and Austen Kinsella who entered John Briggs lovely Frazer Nash Targa Florio, previously owned by Anthony Galliers-Pratt who had raced it with us in the past. Unfortunately, Austen didn't get much tracktime on this occasion. Qualifying went very much to form with the Robin Ellis/Richard Fores Lotus Elite on pole with, not unexpectedly, the ex Tony Crook Cooper Bristol T24/25, owned by Peter Mann, and driven by the very experienced John Ure alongside. It was a front row of contrasts, the modern appearance of Colin Chapman's late 1950's masterpiece with the cycle winged sports bodied F2 car from earlier in the same decade, alongside. This visual contrast was reprised on Row 2 with the svelte Aston Martin DB3S of Steve Boultbee Brooks, qualifying 3rd with the Martin Hunt/Patrick Blakeney Edwards Frazer Nash Le Mans Replica, another cycle winged car alongside. The beautifully prepared Frazer Nash had a very crisp and distinctive exhaust note unlike any other car on the grid. Making it 5 different marques in the first 5 qualifying was Neil Hardy's well driven Austin Healey 100, with the similar car of Jonathan Abecassis alongside. Andy Shepherd had his old faithful AC Ace Bristol in 7th, sharing row 4 with the stunning Lister Bristol of Stephen Bond and on row 5, Martyn Corfield, winner at our BDC race, and Blaster Bates Trophy winner, Mike Freeman, in Austin Healey and Lotus Elite respectively completed the top 10. I won't refer to every car on the grid but I thought Paul Griffin's qualifying position halfway up the grid with the Connaught ALSR was particularly noteworthy. Unable to get out in qualifying on time was the Arnott Lea Francis but Arthur was able to do the required laps in a later session with the John Gross Memorial Trophy race field. Every year, when our Historic Inter-Marque grid comes around on its warm up lap, it seems to go on forever and this year was no exception. What a magnificent sight it made on yet another unseasonably bright October day and probably the best grid of the day amongst a crop of fine grids at this splendid meeting. Sadly some of our qualifiers were absent from grid. The Keith Hampson Sunbeam Alpine Le Mans, Charles Fripps Gomm Jaguar Special, Martyn Corfield's Austin Healey and Graham Oakins Alfa Romeo Guilia Sprint failed to start and Austin Kinsella in John Briggs Frazer Nash Targa Florio only managed only the warm up lap and pitted at the end of lap 1. Details of the reasons for the non starts will be provided when the writer has more information but I understand that the Austin Healey had experienced front end problems during qualifying that were only rectified in time for the later Healey race and Richard Robinson had crashed the Gomm Jaguar during practice acquiring a fractured wrist in the process, and though the owner Charles Fripp raced the car in the Jaguar race, he deemed it too damaged to join the FISCAR grid. John Ure made a great start from the outside of the front row to grab the lead from Robin Ellis, who was also soon to be overtaken by Steve Boultbee Brooks, moving the Aston into 2nd but all the cars made excellent getaways and the field was beautifully bunched as it emerged from Quarry and headed down Farm Straight toward the Esses for the first time. The Cooper Bristol led but was under attack from the Aston DB3S, with the Lotus Elite, Frazer Nash and the Neil Hardy Austin Healey all in close attendance. Andy Shepherd was 6th in the Ace at the expense of Jonathan Abecassis in the Austin Healey and they were followed at close quarters by another 25 cars! By the end of the lap, Steve had taken the Aston into a slender lead from Robin Ellis in the Elite but it wasn't too long before John Ure in the Cooper Bristol reasserted himself in 2nd and latched onto the Aston. Thereafter the two sports racers edged away from Robin who established the Elite initially in a secure 3rd place. The battle for the lead between Steve Boultbee Brooks and John Ure was mesmeric. Although the lap charts show Steve ahead at the end of every lap until he pitted on lap 10, John often had the Cooper Bristol ahead during the course of each lap and the battle was a joy to watch. Robin Ellis had them both in sight but was always a tantalising 3 - 4 seconds away. Meanwhile, Andy Shepherd and Neil Hardy were having their own battle for 4th until Andy pitted early for the compulsory stop at the end of lap 4. Whilst it released Hardy, it was to prove an astute move by Andy who was followed in by Tim Stamper in Richard Bell's Aston Marin DB2/4 and with no great surprise by Brian Arculus, who always pits at the earliest opportunity, in his Alfa Romeo. By the end of Lap 2, Stephen Bond had moved up to 7th and brought the fabulous Lister Bristol onto the tail of Jonathan Abecassis and thereafter they, too, had a great dice for several laps until Jonathan pitted the Austin Healey. In mid-field some great bunches were forming, and with so many wonderful cars on track and so much going on, it was difficult to know where to look but a three way battle between the two Jaguar XK150s of Marc Gordon and Graham Love, and Nick Ruddell's Aston Martin DB2/4 was absorbing until Nick pitted on lap 7 whilst the dice of the two big cats continued unabated. The two of them were later unfortunately to be key players in the unfortunate accident which brought the race to a premature end. Stephen Bond in the Lister Bristol continued to make up useful ground in those early laps; it was shaping up to be a great race. Martin Hunt was going great guns in the Frazer Nash Le Mans Replica in 5th place but was caught and harried by the well driven AC Ace of Ted Murray before Martin dived into the pits to hand over to Patrick Blakeney-Edwards at the end of lap 5. He was followed in closely by Mike Freeman in the Elite and a few seconds later by Paul Griffin in the Connaught. At this stage the Aston v Cooper Bristol battle at the front was still in full combat mode and entertaining the spectators royally and Robin Ellis was beginning to be caught, the 3rd place Elite no longer entirely secure as Neil Hardy, getting into his stride was homing in with his Austin Healey. There was good close racing everywhere and trying to keep up with it all was made doubly difficult by the pit stops, the true positions not likely to emerge until all the cars had stopped and that would be towards the end of the race with such a wide (20 mins) pit window and so many varying strategies. Martin Hunt (Frazer Nash Le Mans Replica) and Ted Murray (AC Ace), lying at this stage 8th and 9th head down the pit straight towards Folly which appears a much more accentuated corner from this angle than it does from most spectator viewpoints and is probably the fastest part of the circuit. The track section above the drivers heads is called appropriately Avon Rise followed by the gentle left hander into the difficult right hander, called Quarry. Chris Woodgate leans in to talk to Adrian Beecroft in the Aston Martin DBR1/300, a model which I must confess is my all time favourite sports racing car. I'm sure that in view of subsequent events Adrian probably feels that it would have been good if his race had ended here. Jonathan Abecassis had been holding down 6th position for much of the early part of the race, in his Austin Healey 100/4, and pitted at the end of lap 11. He headed back into the race, accelerating hard away from the pitlane, through Folly and up Avon Rise toward Quarry. As he hit the brakes, the pedal went virtually to the floor and from then on it was both a heart in mouth experience and a damage limitation exercise. Somehow he slowed the car sufficiently that by the time he reached the tyre wall the nose merely brushed it. It was a great save and Jonathan emerged unscathed to place himself behind the safety fencing where he was well placed to witness the unfolding of the incident that was to bring the race to a very unfortunate and premature ending. Katarina Kyvlova listens to some sage words from car owner Graham Robson before she replaces him in the hot seat of the Austin Healey 100M. The 'Cool Dude' in shades is Paul Woolmer of Woolmer Classic Engineering, our sponsor and provider of excellent hospitality unit throughout the season. 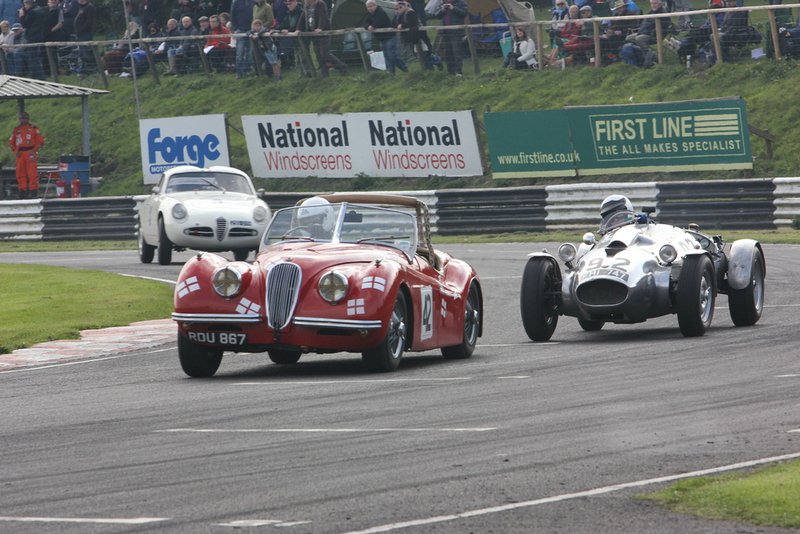 Nigel Grice had pitted his Austin Healey at the end of lap 8, just ahead of the Jaguar XK150 of Marc Gordon who followed him in. Nigel had maintained his advantage when they both returned to the track and in fact, Graham Love, who had pitted earlier got between them with his XK150 and the 3 cars were line astern at the end of their lap 9, as they were all now a lap down on the leaders. Marc had the edge on pace over Graham however, and was able to pass him on lap 1o to slot in behind Nigel and at the end of that lap all 3 cars were still pretty close but with Graham just dropping back slightly. As they entered their lap 11, they were closing on Adrian Beecroft in the DBR1/300 to put him a further lap down. As they approached Quarry, Marc got a run on Nigel and passed him and then went around the outside of Adrian just as they were entering the corner. Unfortunately, the big XK got away from him and he began to spin, at which point Adrian threw the Aston into a spin in an attempt to avoid the Jaguar and so nearly saved a collision. However, both cars were now occupying most of the track and Nigel who was right with them into the corner and on the inside line had nowhere to go with his Austin Healey and impacted the front of the Aston which was now facing him, the Aston being pushed back into the front of the Jaguar which was also now facing the wrong way. Also entering the corner at this stage, but staying wide due to being lapped was Louise Kennedy having just taken over the Lancia Aurelia from Jason and coming up fast on her inside was Graham. Whilst Louise was able to avoid the accident by staying wide and clipping the grass, Graham, like Nigel before him, had nowhere to go and struck the Austin Healey in the rear which pushed the Aston into the front of the Marc Gordon Jaguar again. This last appeared to be the heaviest of the impacts and did the most damage. It could have been worse, as the Pearce AC Ace Bristol was also just behind but scrubbed off enough speed to take to the grass on the inside of the corner. Nigel was visibly shaken as he was helped from his car by Graham. Both the Aston and the Austin Healey were severely damaged and the only car able to drive away under its own power, after a quick check, was Marc Gordon Jaguar. It was inevitable that the race would be stopped and it was to take a while before the 3 cars were trailered away, the state of them a very sad sight indeed. The race was not restarted and results were declared on the basis 0f 12 laps completed but even that was not clearcut as timekeepers initially had Stephen Bond the winner in the Lister Bristol. Stephen had certainly been circulating well in the top 10 but, by his own admission, at no time was he close to the leading cars. The pit stops clearly confused the real situation and indeed a number of cars had not yet actually undertaken their stops. Both commentator, Marcus Pye, and my colleague Mark Campbell, challenged the official results and separately came up with a corrected result and it was clear that Steven Boultbee Brooks was the winner. Martin Hunt and Patrick Blakeney Edwards, a very quick driver pairing, brought the Frazer Nash Le Mans Replica home in to a brilliant 2nd place, and with an equally fantastic drive, Andy Shepherd brought the AC Ace Bristol into 3rd. Last year's winner's Robin Ellis and Richard Fores in Robin's Lotus Elite, were 4th, with John Ure surprisingly only 5th but he had only just stopped and the race came to a premature end before he got back into his stride. For the second year running he had posted fastest race lap at 1.22.734 and he was the only driver to dip under 1.23. However, it's fair to say that the race was run at a slightly quicker pace this year with the first 4 cars all getting in to the 1.23 bracket.